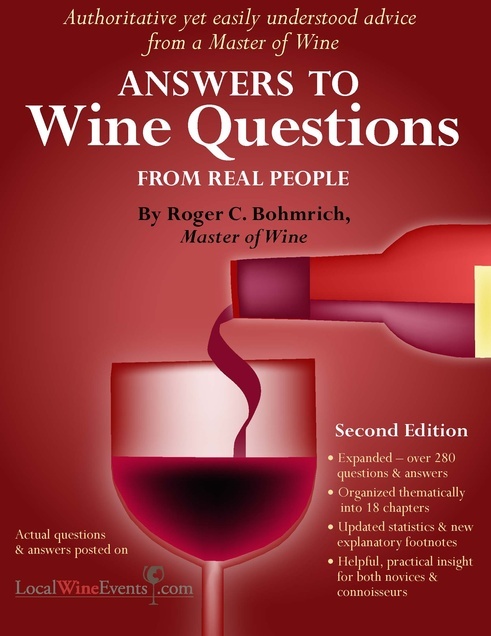 "Answers to Wine Questions from Real People"
Over the past few years, I have been answering questions about wine from visitors to LocalWineEvents.com, the world’s largest website of its kind. I've just published the expanded second edition of my book containing more than 280 questions and answers organized thematically into 18 chapters. There are new footnotes to explain and expand on certain replies. To illustrate pertinent wines and add visual interest, there are color photographs of bottles from my personal cellar. It's easy now for a reader to refer to a specific subject of interest, or simply to read a variety of questions to learn more about wine in all its fascinating dimensions. I wish to thank Eric V. Orange and LocalWineEvents.com for their permission to reproduce the material from the website in this book. I recently purchased a 2009 Super-Tuscan. After doing some research, this wine is 100% Sangiovese. My understanding of what a Super-Tuscan should be is that it contains, in addition to Italian grapes, non-Italian grapes such as Merlot and Cabernet Sauvignon. What am I missing? You'll find several other questions about Super-Tuscans which I have answered on the LWE forum. The term began to be used in the 1970s as a catch-all for wines from Tuscany which deviated from the grape formula set out by Italian wine laws. Super-Tuscans came into being with San Guido's "Sassicaia" in 1968. That inaugural vintage was a blend of two French grapes: 85% Cabernet Sauvignon and 15% Cabernet Franc. Since the blend did not conform to existing rules, the wine was only allowed to be labeled as a simple Vino da Tavola. Now considered one of Italy's very finest and most sought-after red wines, Sassicaia not only engendered the adoption of the term Super-Tuscan for similar renegades from the strict confines of Italian regulations; it also eventually resulted in the creation of a new denomination, D.O.C. Bolgheri Sassicaia. The reality is that the term Super-Tuscan remains very confusing and, frankly, poorly defined. 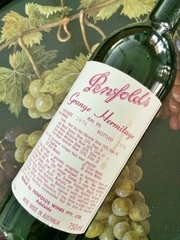 The designation may refer to many qualities of wine from quite basic to, more commonly, the very highest level as well as to many possible combinations of grapes. There are examples which are entirely Sangiovese while others exclude Sangiovese and focus on varieties of Bordeaux origin. Some combine Italian and French grapes. To understand the diversity of Super-Tuscans, you really need a spreadsheet listing all Tuscan producers which shows the formula each one has chosen to adopt. I'm quoting you hoping you could expound on what "extract" is. Also, is structure just a matter of acidity or sweetness? This is a great question as these terms are in frequent use in the world of wine. Extract is typically referred to as dry extract and refers to all the solids which are not volatile. They include a range of substances including phenolics, sugars, acidity (other than volatile), glycerol, proteins and others. The total dry extract differs from one wine to another, and it is not possible to show a specific relationship between these solids and either the body or quality of any given wine. As for structure, interpretations vary, but I would argue for a definition which takes in both tannin and acidity; some argue that alcohol as well is a structural component. Clearly, this term is somewhat elusive but nonetheless very useful for wine tasters, who understand its essential meaning even if they may quibble about all the components. It is understood that structure allows a wine to age in bottle, but not all components are vital for a long life. For example, many red wines can develop over a long period with high tannin content and relatively low acidity, while a top German Riesling with residual sugar, low alcohol and high acidity can also live to a remarkably old age. Where are there wine growing regions in the world where one can still find ungrafted vines? The question of ungrafted vines is a fascinating one. To be clear for those who may find this a mysterious subject, most of the world's vines - an estimated 85% according to a leading expert, Richard Smart - may be grafted onto American rootstocks resistant to the louse commonly called phylloxera. This aphid attacks the roots of vulnerable vines, which happen to be Vitis vinifera, accounting for essentially 99% of all wines produced worldwide. There are in fact entire regions which have been spared from the ravages of phylloxera: Chile, protected by natural barriers on all sides, is an obvious example. Washington State, where phylloxera has been found but has not spread, has been able to prosper with vines on their own roots. There are several areas in Australia where there are so-called pre-phylloxera vines; for example, Langmeil's Barossa Freedom Shiraz from 1843 (possibly the oldest vines in the world) and Tahbilk's 1860 Shiraz from Victoria. There are various parts of California with ungrafted vines such as in the Mokelumne River section of Lodi or Contra Costa County (San Francisco East Bay), where Turley sources a Zinfandel from a vineyard planted in 1896. There are parcels of own-rooted vines in Spain in Jumilla, Toro, Rueda and Rias Baixas. In Sicily on Mount Etna, several producers including Frank Cornelissen, Graci and Calabretta cultivate vineyards on their original roots. In Portugal, the celebrated Nacional Port is made by Quinta do Noval from ungrafted vines in the Douro, and the district of Colares along the Atlantic Coast is unaffected by phylloxera. We could go on with these individual exceptions. In some cases, the absence of phylloxera can be explained by free-draining soils with high sand content. All of this begs the question of whether wines from "intact" or ungrafted vines are intrinsically superior; while the notion is appealing, it is very difficult to argue the case convincingly. The debate is complicated by the role of age: Is perceived quality due to the absence of grafting or to the vines' lifespan, sometimes a hundred years or more? Or to other factors? This is undoubtedly a tantalizing subject, but difficult to pin down.